Back in March 2011I set up a personal weather station reporting to Weather Underground. Thus continued to report until September 2014 when the hardware I was using died. I recently acquired replacement hardware and I now have my site on Weather Underground up and working with data being updated every 10 minutes. I am now using a Raspberry Pi rather than a Tonido plug which I was using last time. But, this useful guide on how to get working on a Raspberry Pi helped make it very easy. I am still using the pywws library, but I am glad to report that it has become even better since the last time. Using the new functionality, the site is also twittering regularly and also send updates to the UK Met Office and OpenWeatherMap. The software also supports a number of more obscure web sites so it is really easy to widely share the data being collected. When I first set up the weather station, there were around 4 or 5 stations reporting from Dublin. However, when I checked recently I see that the number of stations reporting from Dublin has grown to over 50 (possibly helped by the fact that Maplin are selling the hardware in kit form quite cheaply). 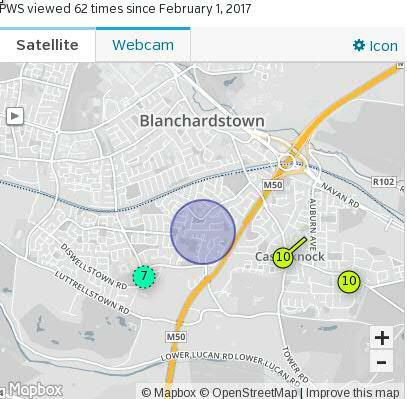 Previously I could claim to be the only wunderground weather station in Castleknock, but now there are 4 quite close to me. One is about 750 meters south west of me. Another is 1km east of me, while a fourth station is about 1km further east. When I have sufficient data collected I might do a little analysis about how close are the data point reported by the 4 stations in almost the same place. Last time I mounted the sensors on the boundary wall. 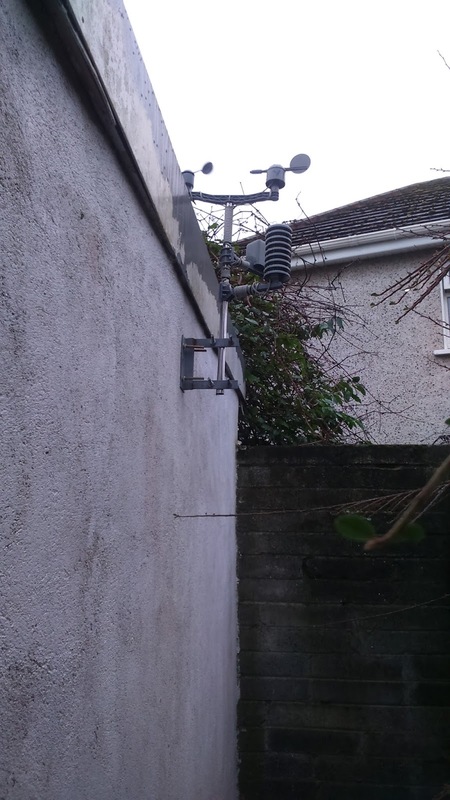 Unfortunately this meant that the wind sensors were blocked by overgrown vegetation in neighbouring gardens. This time I decided the put the hardware on the side of shed where I hope it is less likely to become entagngled.